I have a custom hud where I like the in game part (time, helath, ammo, etc.) and damage numbers but I don't want anything else from it (menu, inventory, etc.). What do I need to change to do this? Check this: http://doodlesstuff.com/?tutorial=tf2hud&page=resource and find out which files are responsible for the things you want to keep, remove the rest? Can you specify what needs to be added to the files for the update or link where you found out? Ok, I found the files needed to get rid of to get the current mm menu ascetic, LobbyPanel.res and LobbyContainerFrame.res in resource/ui. I wanted to add a matchmaking button on my hud (m0rehud black) and I did but when i click it nothing happens. the command is OpenMatchmakingLobby Ladder and if i put it in console then it opens the menu just fine. help? EDIT: Got it working. I replaced OpenMatchmakingLobby Ladder with ladder_ui_show and it works! GameMenu.res, there is a "OnlyWhenCompetitiveEnabled" or something like that for the button, remove that, and it should work. Update core files (hudlayout.res/clientscheme.res/hudanimations_tf.txt) for the contracts. Update mainmenuoverride.res and gamemenu.res to add buttons. hoXyyGameMenu.res, there is a "OnlyWhenCompetitiveEnabled" or something like that for the button, remove that, and it should work. Still nothing. Not appearing in the vgui drawtree menu either. "armedFgColor_override" "235 226 202 255"
"image_drawcolor"	"117 107 94 255"
"image_armedcolor"	"235 226 202 255"
okay so what's been screwed up now What HUD is that? Not sure if this was already asked but anyone know if you can change the color of these type of crosshairs? never heard of this, how would that look if used properly? edit - figured it out, works great, thanks for the tip. Does anyone know how to remove these white lines from my backpack. how do I remove the health cross? may i ask whats that hud? yahud fragvid. i have an updated version from Yoshi if u want. Dogo-godDoes anyone know how to remove these white lines from my backpack. Hardcode the colors in CharInfoPanel.res (the top/bottom white bars) and CharinfoLoadoutSubpanel with the class loadout selection. You scrolled passed this link in the 2nd post on this page with the Doodle resource list. You scrolled passed [url=http://doodlesstuff.com/?tutorial=tf2hud&page=resource]this link[/url] in the 2nd post on this page with the Doodle resource list. Also there's a white square in the top left corner that shows up sometimes, any idea how to get rid of that? Game crashes immediately on launch when matchmaking is active (at least for the stress test, can't confirm beta pass). Deleting my main menu (gamemenu and mainmenuoverride) fixes the problem, so it must lie there. Here is my most recent commit for those files. Is there something I am missing or did a dumb with? 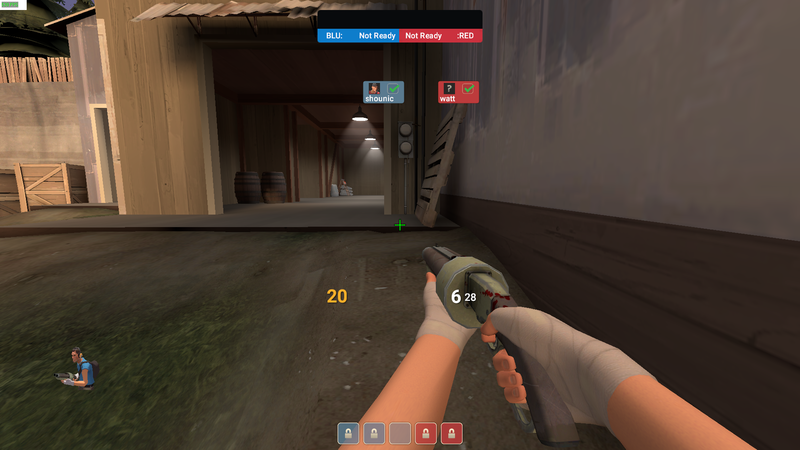 How do I disable the flashing health cross behind buffed or low health in omphud edited? I just want the numbers to change color when I'm low or buffed no flashing animations.